Ginkgo Biloba (Maidenhair tree) belongs to the oldest family of trees which appeared on our planet about 280 million years ago. The plant survived the Ice Age in the Far East and since those times it did not change a lot. In the middle of the 18th century this plant was brought to America and Europe as an ornamental tree. Later on, its therapeutic properties were discovered, and nowadays Ginkgo Biloba is in top 10 of the most selling herbs in the US. Ancient Ottoman and Oriental medical practitioners used leaves and seeds of Ginkgo Biloba to treat almost every known disease and health problem, starting from asthma and ending with sexual disturbances. The plant contains bioflavonoids with P-vitamin activity, (such as kaempferol, quercetin, etc. ), bilobalides and ginkgolides, several natural antihistamines, and has anti-inflammatory, antioxidant, vermifuge and tonic properties. 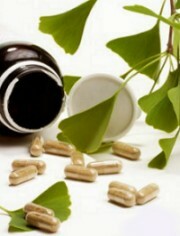 Extracts and products containing Ginkgo are used for treatment of various diseases and medical conditions. First of all, it is known for its positive effects on people with Alzheimer’s disease. After taking medications based on Ginkgo extracts, patients who suffer from this disease demonstrate better cognitive functions and increased physical performance. Besides, Ginkgo can normalize blood circulation and this way can improve overall health and mental abilities. It increases efficiency of metabolism, helps to improve use of oxygen in the brain, stabilize and regulate neurotransmitters, as well as maintain high energy level. Ginkgo is an effective remedy for memory loss, fatigue, vertigo and tinnitus, asthma and various allergies, male infertility and impotence, etc. Ginkgo can be used in the forms of extracts, tinctures, tea or capsules. Specific dosage depends on health condition and duration of treatment. Despite of numerous advantages of using this plant, Ginkgo Biloba can cause some side effects that must be taking into account when making a decision about using medication and remedies containing this ingredient. Usual side effects include headaches and restlessness, as well as some gastrointestinal problems, diarrhea, nausea, etc. This herbal remedy causes increase risk of bleeding, that is why it is not recommended to those patients who have a clotting disorder. Finally, the products containing Ginkgo Biloba must not be used during pregnancy and breastfeeding since there are no reliable researches carried out in this field.